The bedroom benches can be used for many purposes such as; for sitting, to put on the shoes and some of these benches also come with storage space. These benches also make your rood look good. If you have modern style furniture; the modern bedroom benches would be great to use. The handsome Kempston Upholstered Bedroom Bench Upholstery is a solution to all your extra seating problems. Its neutral tan finish blends beautifully with a wide ray of home décor. The seat and the back of this banquette are embellished with antique brass nail head trim. You can place this banquette in your foyer, living room or along one side of your dining table. Constructed from wood composites and select hardwoods. Finish: Grey with brown and tan tones. Also available in Café finish. Seat is webbed for additional strength and stability. Thickly padded seat for a comfortable seating experience. Seating capacity for one person only. Back is padded and slightly sloping for optimum comfort. Straight legs in dark espresso color. Upholstered and accentuated with nail head trim at the base of the seat and perimeter of the back. Product Care: Use a damp cloth to wipe clean this banquette. Avoid using liquid cleaners. Bring playful delight to your home with the admirable Abaokoro Upholstered Two Seat Bedroom Bench. It features elegantly scrolled arms complemented with dark brown legs. The front base of bench is accentuated with rectangular shaped silver nail head trim. The gray colored linen upholstery gives a warm feel to its overall look. Made from rubberwood, this foam filled bench with removable seat cushion will adorn your contemporary room décor. It is a two seat bench and can easily accommodate two people. Can be placed in any room of your home. Also available in Light Beige color. Upholstered in easy to care faux leather. Silver nail head trim at the front base. Arms feature elegant scroll design. Stylish dark brown wooden legs. Adorn the feminine charm of your bedroom with the stunning Thurston Upholstered Storage Bedroom Bench. 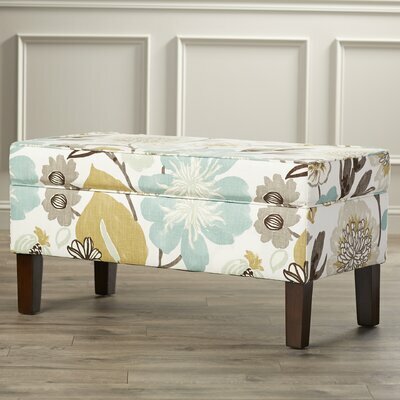 It features a gorgeous and colorful floral pattern on cotton upholstery. The comfortable and soft seat ensures a relaxing seating experience. It comes with a hinged flip top storage space hidden under the seat. You can keep your magazines and books in it along with many other things you want. Handcrafted in USA from finest quality of wood. Lovely pearl colored floral pattern. Straight legs in brown color. Flip top storage compartment with hinged lid. Manufacturer provides one year limited warranty on this bench, excluding fabric. Product Care: Spot clean only. The modern fashioned St Philips Upholstered Bench will beautify your home interior. This robust bench features birch wood construction with sturdy black legs. High density polyurethane foam filling offers you a very cozy and comfortable seating. 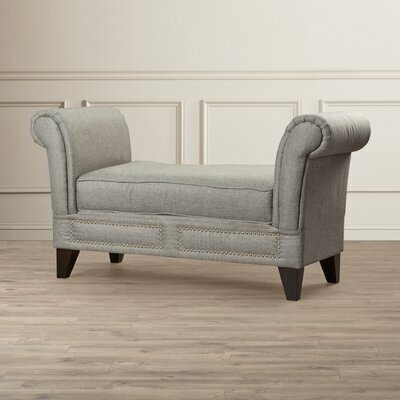 The dark gray colored upholstery is artistically adorned with button tufts and metallic nail head trim in silver tone. This stunning bench has a paneled and wingback backrest for an outstanding look. This bench is also available in Light Beige color. It can easily accommodate two people. Cushioned with high density polyurethane foam. Embellished with button tufts and silver tone nail head trim. Black tapered legs made of strong wood. The glamorous Rosanna Upholstered Bedroom Bench will create a stunning focal point in your bedroom. Dozens of dazzling faux crystal tufts embellish every nook and cranny of the bench. They glimmer beautifully when light reflects on them and takes the bench up a notch. Black leather upholstery with chrome plated metal legs accentuates its overall look. Sturdy rubber wood frame and generous foam padding with fascinatingly charming look makes this bench a must have. Faux leatherette upholstery cushioned with polyurethane. Beautifully tufted with dazzling faux crystals. Chrome finished legs in cabriole style. Add old-world charm to your bedroom with the mid-century Alcott Hill Adele Bedroom Bench. This stylish yet functional bench can be utilized as smart seating option in any room of your home. Use it as a coffee table or set it along the foot of your bed as extra seating space in your bedroom. This modern style bench features bicast leather upholstery with tufts and individual nailed cornering. The edges are detailed with chic nail head trim for appealing style. The bench frame is crafted from solid birch wood that renders strength and durability to the overall structure. Bedroom bench with seating capacity for one person. Upholstered and adorned with tufts. Chic stainless steel nail head trim detailing in silver finish accent the edges. Available in multiple finishes with three different upholstery fabrics including faux leather, linen and cotton. Amplify the adornment of your modern themed living area with the stylish Sunpan Modern Ikon Darby One Seat Bench. It features a leather upholstered seat that is supported by square shaped legs. 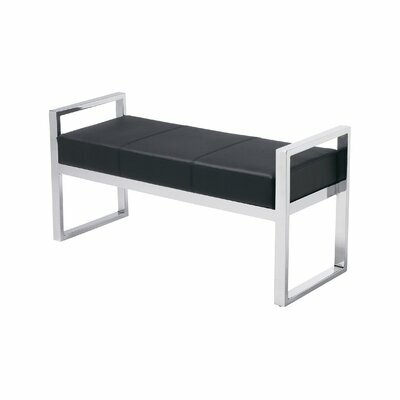 The chrome finished legs complements the black colored upholstery to create a classy bench. Metal frame renders optimum strength and endurance to the bench that makes it durable and long lasting. It is perfect for your foyer or along the foot of your bed. This versatile bench is deemed acceptable for both residential and commercial use. Black colored faux leather upholstery. Does not occupy much space. Squared legs give a stylish touch. Apt for both commercial or residential use. Comes assembled to save you the trouble of setting it up. Manufacturer provides one year warranty starting from the date of purchase. 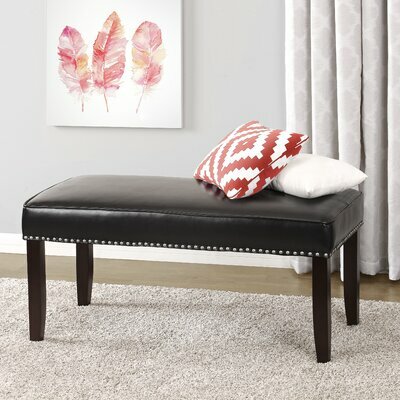 The elegant Rowan Nailhead Trim Bench is a classic style bench with a modern flare. 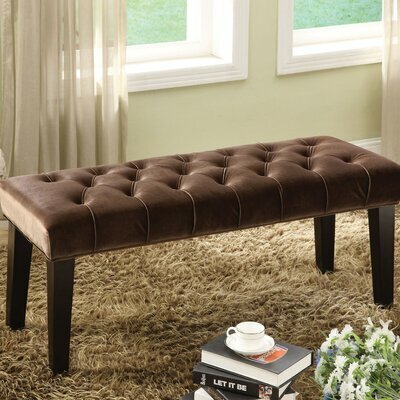 It features a classic design bench which is upholstered in rich espresso faux leather. Sturdy wood construction with solid wood tapered legs makes this bench durable to last long. The antique nickel nail head trim at the bottom edge gives this bench a finishing modern twist. 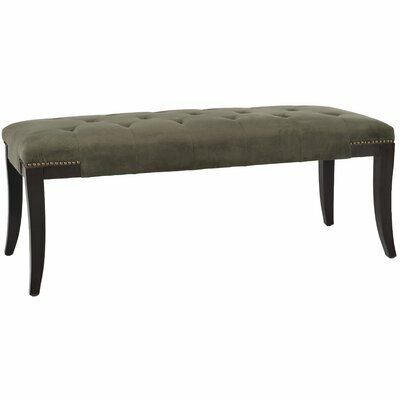 Avail this nicely padded bench as extra seating in you foyer, living room or bedroom. It can also be used as entryway bench. Nicely lined with rich espresso faux leather upholstery. Antique nickel colored nailhead trim detailing around the bottom edge. ISTA 3A certified for safe transit. One year limited warranty on materials and workmanship. 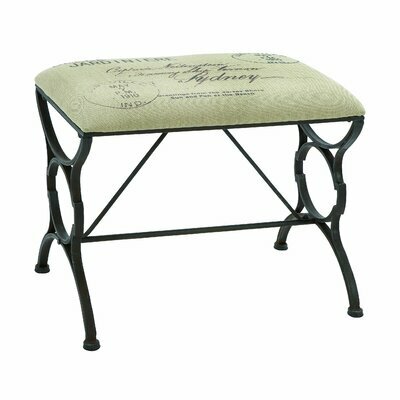 Bring the romantic feel of Paris to your home with this charming Woodland Imports Paris Postcard Bench. This glamorous bench pays homage to postcard travelling with its artistic graphics of old postage stamps and manuscript messages in nice cursive. Place this bench in the entryway and impress your guests when they enter your home. Strong and sturdy metal bench. Stylish black legs with a circular and a semi-circular design. It comes assembled and saves you the hassle of putting it together. The stunning Hokku Designs Rocco Upholstered Bench will add style and elegance to your bedroom decor. Its charming dark copper upholstery with detailed tufting radiates an aura of pleasing warmth around room. The sturdy espresso finish legs not only support the bench but also complement its gorgeous look. It is lusciously cushioned for maximum comfort, this bench will not disappoint you a bit. This bench can easily accommodate two people. It features detailed tufting design complements the copper color. It is generously cushioned seat for quality comfort. Straight legs with appealing espresso finish. Best for the foyer or along the foot of the bed. Comes with a 30 day limited warranty. Product Care: Avoid using harsh chemical cleaners.